SuperFogeys - LAST DAY to Back SuperFogeys Vol. 1: Inaction Heroes! THIS IS IT! 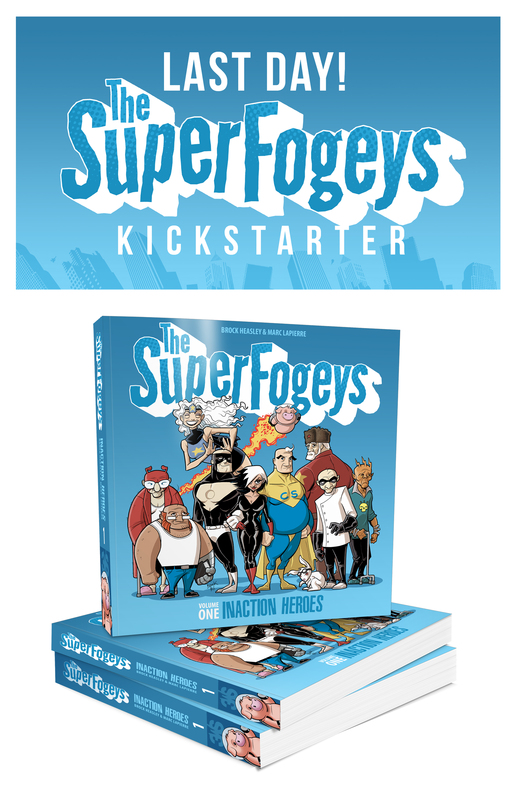 There is less than 24 hours left to back the SuperFogeys Kickstarter and secure your copy of Volume One: Inaction Heroes, a 300-page book collecting the first SEVENTEEN chapters of the SuperFogeys saga and bunch of SuperFogeys Origins stories besides. We’ve blown past SIX stretch goals, so there’s a bunch of goodies available to our $35+ backers, too. Goodies like: a bookmark, mini-prints, and a specially created Map of Valhalla EXCLUSIVE to our Kickstarter backers. Want in? It’s all over Nov. 16, 2018 at 8am, PST. Jump over to Kickstarter now to see all the details and make your pledge! Any chance of us getting new comics anytime soon? We’re coming down to the wire on the story, and if you get hit by an Amtrak train, we don’t want to get stuck on “Activate the Omega 13!” forever. Hey Gwen! Pushing out an update real soon to explain what’s going on and how SF can get going again. Thank you for your patience!